The space you have just stepped into has no weather. Is your body pulsing like volcanic lava or stiff like a giant iceberg? The inhabitants expose their bodies to cosmic rays and experiment with their tolerance limits. Some astronauts made themselves fall from phenomenal heights. However, no one knows whether they fell or not. When the Sun has more magnetic storms, the night auroras shine with greater intensity. Only during the nighttime, music here travels a great distance, almost reaching to the earth. Are your movements holding gravity tight? Or did you accidentally slip into outer space as if you were dusted off by solar wind? 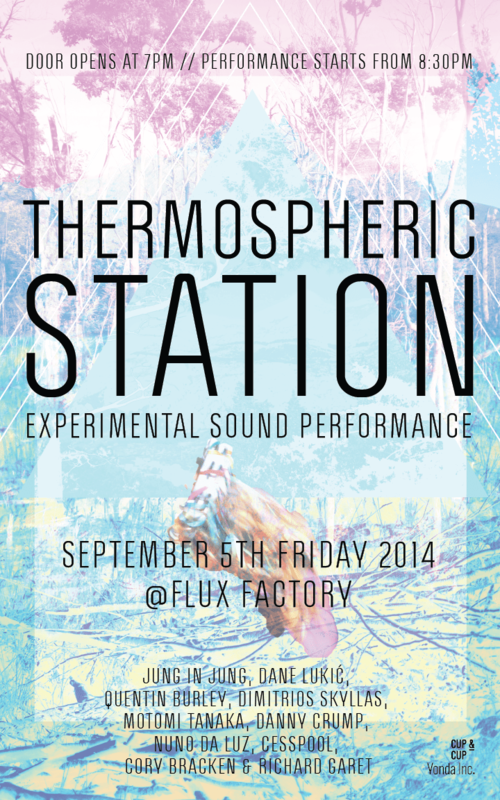 The Thermospheric Station brings together sound artists, contemporary classical composers, experimental musicians and contemporary dancers from different sides of the world to create an experimental sound performance. Coming from Greece, Portugal, Bosnia, USA, Japan, and South Korea, this diverse group is presenting their work at Flux Factory in New York. Composer Dimitrios Skyllas wrote a piece for a trio based on Rilke’s poem “Autumn.” The vocalist Motomi Tanaka will perform alongside percussionist Cory Bracken, and Skyllas will complete the trio on melodica. An emphasis is given on the word “Someone,” where the composer contemplates the (non) existence of a superior force. Jung In Jung, a current artist in residence at Flux Factory, will present a dance and sound collaboration. The sound composition will be improvised by both the limited and free physical movement of two dancers, Dane Lukic and Quentin Burley. Triggered by a game controller’s red wires, data relating to the position and length is then programmed to manipulate sound. In “Pull,” the band Cesspool explores magnetism and verticality. They experiment with three-dimensional speaker placement and vertical space, and build arrival points into the structure of the piece, approaching said points with exponentially increasing and decreasing momentum. Cesspool will present their works under the artwork, “Sound Cave,” by Danny Crump. The shape of the dome creates a unique acoustic amplification, further layering the effect of the sound. Richard Garet‘s performance will focus on creating processes that interact and activate sonic material such as electromagnetic waves, modified tape, cracked media, sonification of light, and computer processing. This sonic construction will surface in real-time, creating a poly-layered sonic field where the final outcome consists of amplifying manifestations between the materials and articulating colliding forces being carefully treated, weighed, and measured. The concert is organized by Jung In Jung and produced by Sungpyo Hong. Audiences are invited to explore the variety of performances with delicious refreshments provided by Cup&Cup and Yonda Inc.
Poster design by Amela Parcic. Special thanks to Nat Roe, Will Owen, Tina Kohlmann, Sandy Gordon, Lola Bengen, and Julian Navarro.